Update: this particular model of solar anti squirrel bird feeder has been discontinued. Please check some other squirrel shocking bird feeders that are currently available. What we have here is review of really unique type of anti-squirrel bird feeder that differs much from any other bird feeder you can buy online. 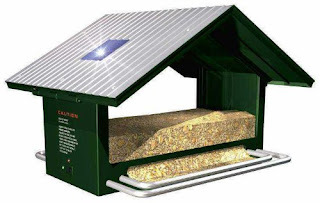 Among the other features, "Squirrel-Off" solar bird feeder is possibly the most expensive squirrel proof bird feeder in the market... but in return - it is technologically the most advanced bird feeder ever! Basically, the "Squirrel-Off" solar feeder belongs to the group of electric squirrel proof bird feeders, but unlike any other other feeder it uses solar energy for its anti-squirrel tactics.So let's see how this feeder works. My first impression is that the designer of this bird feeder did not care too much about feeder's decorative side and it seems that the feeder's functionality comes first here. A minimalist looks, resembling simplified metal birdhouse painted green is a stereotype seen so many times in many of bird feeders in the market these days. Bird food is not served through feeding holes, but from feeding platform and the birds are offered two roosts to comfortably find the place on. Good thing about the way the feeder's construction is that it is really easy for cleaning, and also it is up to your choice whether you are going to hang it or place it on a pole. But what's that blue square on feeder's roof? Well, that is a solar cell that collects light energy and turns it into electric energy that is necessary for keeping this feeder "squirrel free". So how it works? "Squirrel-Off" feeder gives small and absolutely harmless electric shock to all attacking squirrels. Practically, it is static electricity you feel sometimes when shaking hands to someone... sounds familiar, right? The whole idea is to keep the feeder under electric charge till the squirrels touch it. The moment the contact happens the snapping static discharge runs through squirrel's limb and it simply runs away. The best thing about it is that this feeder does not need battery - it is completely on autopilot due to self-recharging from solar energy. But how come the birds don't experience the same? It's because the birds have very different body structure from the squirrels and are virtually immune to the risk of small voltage electric shock. BTW, similar tactics to scare away the squirrels using electricity may be found with battery powered electric squirrel proof bird feeder created by Wild Bill. Where to buy "Squirrel-Off" solar powered bird feeder? If interested, you might want to check the price at this trusted Amazon.com link. I have had this feeder for almost 6 months . It worked good right out of the box , But when it rains it does not work , when it is dark for a day or two it does not work , some times it just does not work ! it needs more battery reserve , I have had to bring it in and put a light on it to charge it up . you cant leave it on all the time it goes dead . When it does not work the squirrels chew the feeder up ! you can't change the batteries because they are soldered in . please fix the problem with this unit .